Instead of dreading summertime worker “absentees,” use this tool and look forward to your summer schedule! I’m talking about “Sign Up and Show Up.” This is a simple, fun, out-of-the-box procedure you can use to find volunteers for the summer months. It’s a great idea to give your regular leaders the summer off - in fact you may want to insist on it. It’s a wonderful thing to give a start date and a finish date when you invite a potential volunteer to join your kid min team. Many people are hesitant to give you a “yes” when, in the back of their mind, they imagine they’ll be serving ’til Jesus returns! Knowing there is a set date to finish the year (and they will have summer off) might be what potential leaders need to hear. We’ve also found that having a set end date strengthens many peoples’ dedication to serve. We all want to finish well; we feel the drive to push through and be present when we only have a limited number of weeks in which to impact our kids. And after having two months off, those leaders are eager to get back to serving their kids in the fall. They come back refreshed and renewed, raring to go. I can hear you asking, But if my regulars are off, who will serve in June and July? Ask the members of your congregation to simply sign up and show up for one week, no strings attached! We have found that in most churches, when the director explains that they are giving the regular leaders time off, people are happy to sign up. During these weeks, rework your program so there’s no prep involved for the volunteers. We’ve created this effective (and adorable) video to help you get the word out! Play it in your main service in late April or early May to get your slots filled up. On that day, collect names, phone numbers and emails. The next day, call or send an individual email asking what dates work for that person, and send your background check form to him/her. (Be sure to protect your kids – every Sign Up and Show Up volunteer must have the proper background check.) Don't send a group email. Individualize it with the person's name so feel valued are are much more likely to respond. This method fills your summer need, but as it turns out, it’s also a great recruiting tool! As children’s director, you’ll get to see new folks in action. It will be apparent who is naturally gifted to work with kids. Put these folks on your list of those to prayerfully approach for the fall. And it will be an easy ask, because you can point out the positive things you noticed about them when they served over the summer. When new people enter the doors of your ministry, their eyes will be opened to how intentionally you are pouring in to kids, and they just might be blown away by the thought of having eternal impact on the next generation. With the intimation factor removed because they have already tested the waters, so to speak, many will be excited to come back in the fall on a regular basis. It’s a win/win all around! For the summer Sundays, you’ll still need one fully prepared teacher to teach and "run the show"–or a handful of these folks, for a larger ministry. Consider getting an intern (or interns) for your summer helper(s). Or you could recruit a “summer teacher” who can commit to the summer but then take the school year off. Send each SUSU volunteer an email with the plan for their particular Sunday. Even though they don’t need to prepare anything, they’ll appreciate a heads-up as to what the kids will be learning. When SUSU volunteers arrive, brief them again on what you're doing for that day and invite them to be a part. Most of the time they will help with a game or craft or an object lesson, as well as helping corral kids and redirecting attention when needed. Show them anything they need to know, such as how to do the craft, or rules of a game they'll be helping with. On Sunday, for the most part, everyone will stay together for the entire gathering: large group lesson, large group activities, and worship. If your group is pretty large, you can divide in half and rotate between some activities like craft and games. You’ll still have your large group lesson. 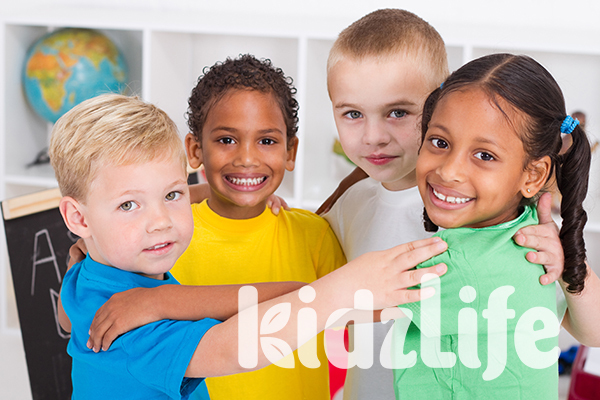 Instead of breaking into small groups, you’ll keep your kids together. Attendance is generally down, so keeping them together will probably be just fine numbers-wise. If the curriculum you’re using has a small group component, you can do the small group questions and activities as one large group. If there's a hands on component, you may just call on volunteers to come up and do it in front of the group as a demonstration rather than everyone taking part. Then choose the following components that best fit your time: worship, review game, craft, and game. Say it Again Sam: Before you teach your lesson, tell kids to pay super close attention; you’ll be asking one of them to reteach it after you. After you teach, ask if there’s anyone who can retell the story. They can only tell the parts you told, and can’t add anything extra. After the child tells the lesson, affirm how well they did, and then ask the remainder of the kids if there is anything that was left out. This repetition is great for retention. And when kids tell it, it’s extra fun too. What did you like best about the story, and why? Do you have any questions about the story? What do we learn about God in this story? What do we learn about people in this lesson? How are you like or unlike (each person in the story)? How does this story make a difference in your life? What do you think God wants you to do about this? If needed, incentivize participation with a tiny treat (even one m&m or Skittle will work) for every answer given. Charades: Pick out a few characters or situations from your lesson (or past few lessons). Ask for a child volunteer who can come up and act it out for the group. Whisper the character or situation to your volunteer. The first child to guess correctly gets to act next. This game works Pictionary-style on a white board or large paper. Review: You can (naturally, automatically) prepare review questions in advance. Each week while prepping for the Bible lesson, you or your Bible teacher get in the habit of typing out a few questions pertaining to the heart of the lesson. (Tip: Send them to your phone each week so they are always with you.) It should be simple to search back a few weeks and ask questions. If you stash a bag of Starbursts somewhere in your venue, kids will be eager to answer questions in order to earn a piece. Ask a Pastor: Tell kids they are free to ask you anything about the Bible and God’s kingdom. If kids are older, give them a few minutes to write their questions on index cards before you collect them and answer for the group (this way questions are anonymous and you can make sure they are appropriate for all ears). This is a great exercise to dispel myths and to hear where your kids are spiritually. Prayer Circles: Separate kids into groups of around 12 or less. Have them get into a circle to pray. One person will start off by lifting up their requests, then tap the person next to them to signal that it is his/her turn to pray. That person prays, and then taps the next person. If a child does not want to pray out loud, they simply tap the next person. When the prayer makes its way back to the first person that prayed, he/she closes. It’s amazing how God created each of us with differences and similarities. No two people (even twins) are exactly alike in every way! God crafted each of you to be uniquely you (Psalm 139:13, Jeremiah 1:5). Heads or Tails: Tell everyone to stand up. Kids choose heads or tails by either putting their hands on their own head or hands on their own, well, back side or hips. Then kids freeze while you flip a coin. Winners remain standing (if it lands on heads, the kids who chose tails sit down; if it lands on tails, the kids who chose heads sit down). Those who remain standing choose heads or tails for another round. Keep playing until you have one winner still standing. Reward him/her with a small prize. Then everybody gets up to try again. Pick a Side: Divide the room in half with tape on the floor (or draw an imaginary line). All kids stand up and they will pick a side of the room to go to, determined by their favorite one of each pairing the leader calls out. Leader points to a side of the room as he/she calls out each of the two options. If a child has no preference, they are free to stand in the middle of the room. Four Corners: This is an old standby. Number the corners in your room, 1-4. Label each corner by taping up a paper sign. Choose one child to be the caller. He stands with his back to the room, counting to 5 (the 1 Mississippi, 2 Mississippi method). While he counts, every other child quietly chooses a corner to stand in. After the counter, the caller calls out a number from 1 to 4. Everyone on the corner he chose must sit in the center of the room. This process continues until there is only one person left standing. That child becomes the next caller. We hope this is helpful :) Be sure to let us know if you try Summer Sign Up and Show Up, and how it goes for you!